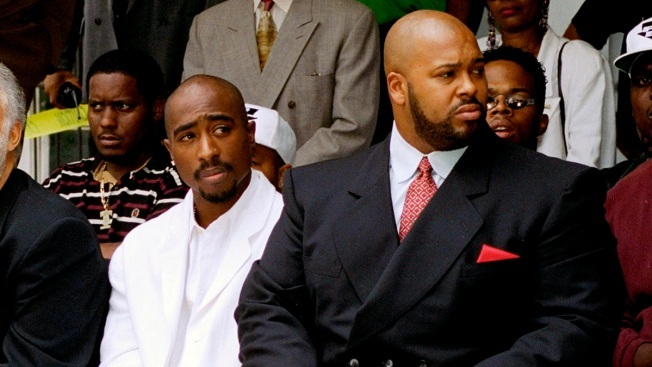 The widow of a man killed when Marion "Suge" Knight ran over him with a pickup truck has sued the one-time rap mogul and other key figures in the making of the upcoming movie "Straight Outta Compton." Dr. Dre, Ice Cube and Universal Studios are also named as defendants in the wrongful death lawsuit that victim Terry Carter's widow Lilian Carter filed in Los Angeles Wednesday. Terry was fatally struck by Knight in the parking lot of Tam's Burger's back in January. Her suit accuses them of failing to provide adequate security and negligence on the set of "Straight Outta Compton," a biopic about the rise of N.W.A. She says Universal was negligent by continuing to film in and around Compton, even though Knight had been feuding with Dr. Dre for years. Knight managed to appear on the set, despite warnings from Dr. Dre to the security team to keep Knight away from the production, according to the suit. The suit also says that Universal was negligent by hiring Cle "Bone" Sloan as an adviser on the production. The run-in that killed Terry Carter occurred a short while after Knight was told by deputies providing security to leave a film location after arguing with Sloan, who was working on the set, during a break from filming a promotional video for the biopic. The argument resumed and escalated a short while later at a fast-food restaurant a few miles away, with Knight and Sloan exchanging punches through his open window, LASD Lt. John Corina said at the time of the crash. Corina said Knight backed up his pickup truck and knocked Sloan down, before hitting Carter and driving off. Dr. Dre's attorney Howard King called the lawsuit "preposterous." Universal and Ice Cube have yet to comment. Last week a motion to dismiss the murder case against Knight over Carter's death was delayed because he changed attorneys, hiring the man who successfully defended Michael Jackson against molestation allegations. Knight has pleaded not guilty in the murder case, and his previous attorney said he was fleeing an ambush. NBC4's parent company NBCUniversal owns Universal Studios.